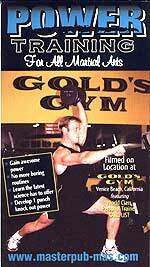 This DVD was shot on location at Golds Gym Venice Beach California “The Mecca Of Bodybuilding” World Class Personal Trainer Karl List will show you more in one hour about getting power into your technique then you will learn in one year. He does not try to teach karate or any martial arts techniques but instead explains, shows and teaches the reason why some techniques have power and why some do not. List shows the most advanced scientific ways of attaining maximum efficiency for all techniques. You will learn how to use weights properly to enhance your training so that you become the best you can become. Anyone serious about their training will benefit enormously from this DVD on POWER.